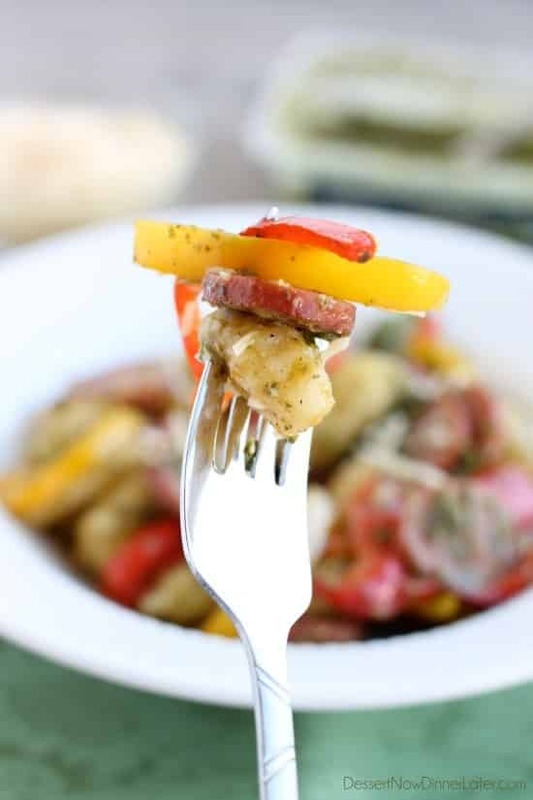 Pesto Gnocchi with Sausage and Peppers (+ Video) - Dessert Now, Dinner Later! 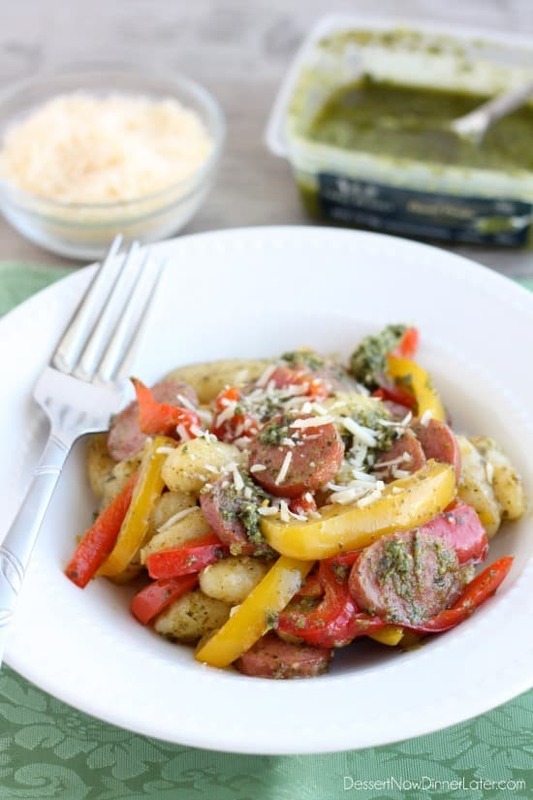 This Pesto Gnocchi with Sausage and Peppers whips up in less than 30 minutes for a fresh, vibrant, and hearty dinner! Let’s talk about gnocchi! Have you had it? Do you know what it is? It’s basically a potato pasta. Just plump, round balls of potato goodness! It cooks up fast, like 3 minutes, in a pot of boiling water! Now let’s talk about pesto! I LOVE PESTO! 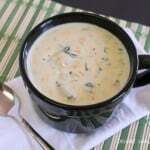 It’s traditionally basil, toasted pine nuts, parmesan, and olive oil blended together. I accidentally killed my pesto plant this year, so I cheated and got store-bought, but let me tell you, I tried a new brand for today’s post. It’s called Three Bridges Basil Pesto Sauce and you find it in the refrigerated section, but it’s the GREENEST jarred/packaged pesto sauce I have ever seen. The ingredients are all things you recognize and can read on the label, which also impressed me, and it was probably the tastiest packaged pesto I have ever had! (This is not sponsored, by the way!) So if you see it, you need to try it! 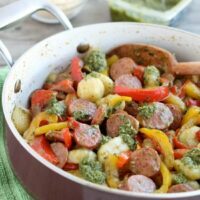 The fresh bell peppers and smoked sausage give this dish color, texture, and heartiness, while the parmesan on top completes the dish! Simple ingredients, simple prep, delicious dinner! I hope you are as excited to try this dish, as I am about sharing it with you! It’s already listed on our dinner rotation again! Set a pot of water on the stove to boil for the gnocchi. Heat the olive oil in a large skillet. Sauté garlic until fragrant; about 30 seconds. Add smoked sausage and cook until starting to brown. Add the sliced peppers and cook for another 5 minutes, until tender. Meanwhile, boil gnocchi until it floats, about 3 minutes. Drain and add to the skillet. Add pesto and toss everything together. Season additionally with salt and pepper, if needed. Serve with a sprinkle of shredded parmesan cheese. Italian food really is the best! 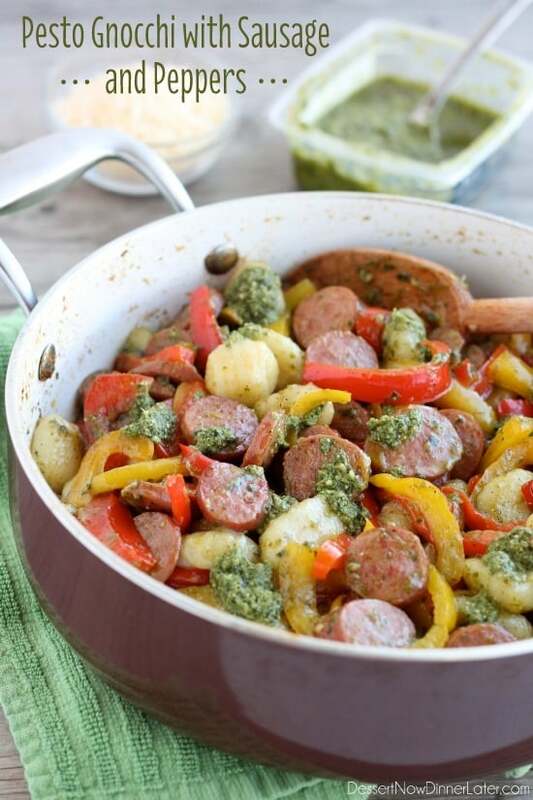 And when you pair gnocchi with sausage and pesto, it’s even better. I love this, Amber. Pinning! 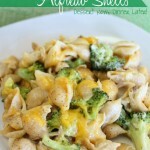 This meal has become a life saver in our house lately! Just quick, easy and delicious! Thanks for pinning! 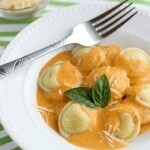 I’m Italian, so I love, love, LOVE Italian food! I hope you get a chance to try this! This is definitely my kinda skillet dinner! 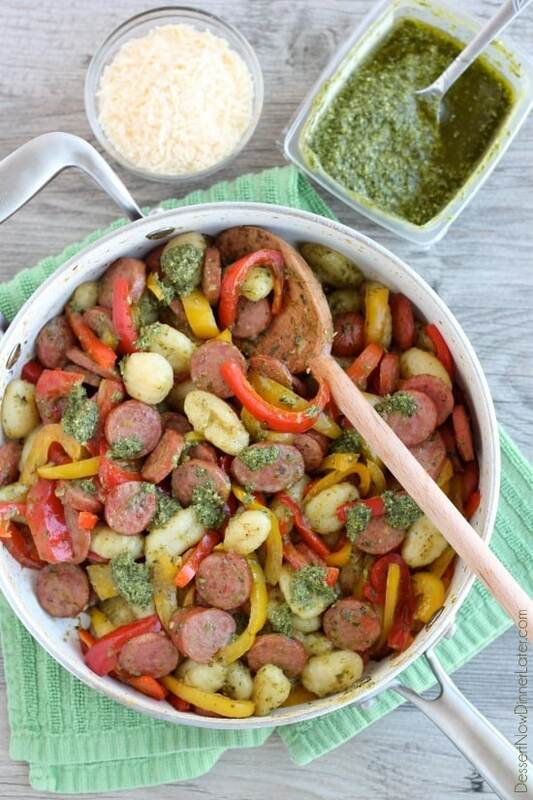 I love that you packed all that pesto inside with the gnocchi and sausauge—my favorite! 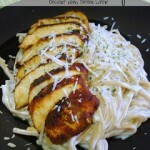 This is one of my new fave EASY weeknight meals! It’s tasty! Thanks Jocelyn! We’ve made it a few times now! I love the simplicity of it! Nice Sonya! So glad to have inspired your tasty dinner! Love those alterations!